This year has been an absolute whirlwind!! I am so thrilled to keep busy, and life is wonderful, but my blogging has been slacking! I am playing catch up and really love getting a chance to look back through some of the bee-yoo-tiful projects we've done lately! 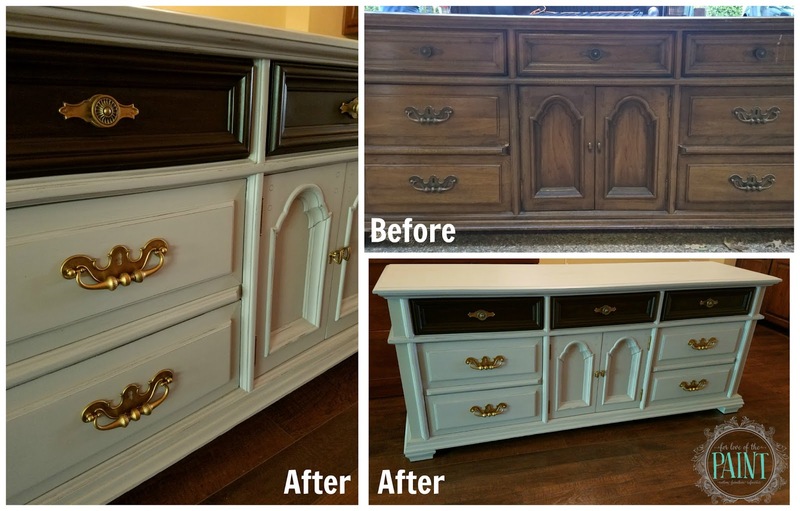 Here's one of my favorites - a totally 60's lowboy dresser / credenza with an absolute facelift! 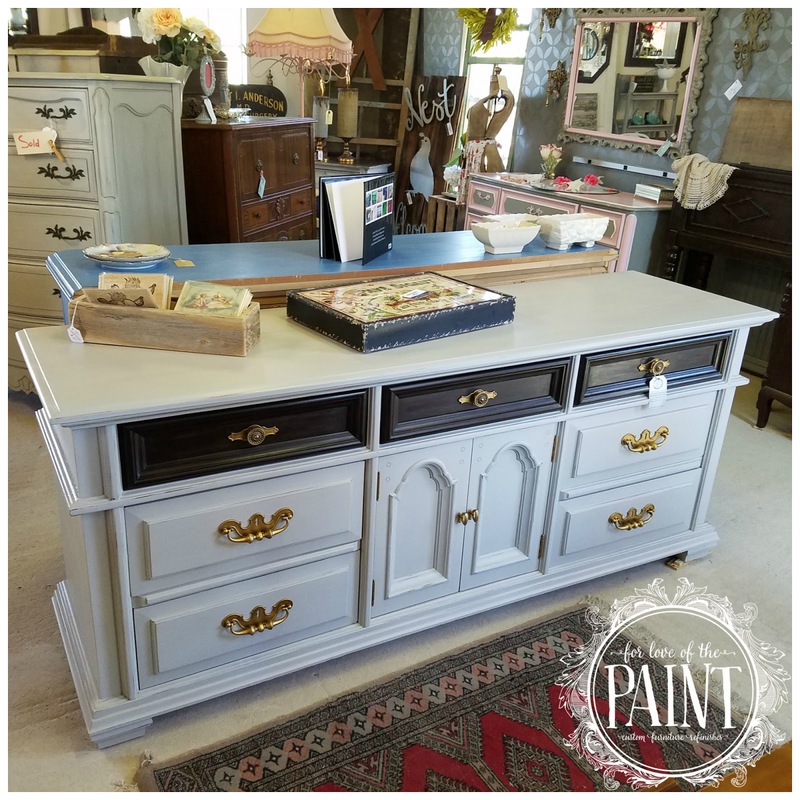 I painted this with Annie Sloan Paris Grey, and put General Finishes Java Gel Stain on the top drawers. 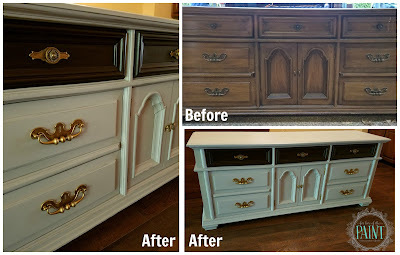 Read on for details of how we got from "Before" to "After"! The hardware couldn't be taken off the top drawers without risking damage to the piece, so I used some flexible sandpaper my husband had picked up in order to prep the drawers. Let me tell you, that stuff is Ah-Mayyy-Zing.... once you get the hang of it! It felt a little strange when I first started using it, but the results were totally worth it! The hardware was updated to an antiqued gold with Rub and Buff - also one of my new favorites! I used a Qtip to apply to the stationary hardware, and my fingertip to hand-rub the removable hardware. I even taped off the visible portions of the cabinet hinges for a little modern update - it's all in the details!! I distressed the edges ever so slightly, and just fell in love with the end result! I think it's going to be absolutely perfect in the right room, whether it's a bedroom or as a media center / credenza. This piece is just lovely!! Here she is in more sunlight in the shop. Isn't that gray and stain just so chic together?? Tell me - what are your favorite products to use? I'd love to check them out!